There’s an old expression that when you go to NAB Show in Las Vegas, you either go big or you go home (well, it’s something along those lines) and after being welcomed so enthusiastically last year, FEED comes – in full force – to NAB Show for a second time. This year, we’re looking to form more great partnerships and to build even more diverse and innovative content for the magazine and website. We’re looking forward to checking out the Esports Experience, as well as the AI+Cloud Campus, and we can’t wait to hear about the new technologies around cloud, AI, AR and streaming video, but with so much going on, how best to survive and, indeed, thrive? NAB Show is not necessarily a place for long talks with partners and extensive co-strategising. Get in, get out. NAB Show is actually the world’s biggest speed dating meet-up. Sure, you’ve scheduled a 30-minute slot, but do you really think you’re going to make that on time? At best, you’re going to arrive ten minutes late. Then it’s five minutes on the stand trying to extract the person you’re supposed to meet from some interloper. And it’s going to be a minimum of ten minutes to go to your next appointment way, way in the back corner of South Hall (Upper), meaning you’ve really got five minutes of useful conversation time. So, keep your meetings to the point. Monosyllabic. Up front, with no ambiguity. You’re like a lone scout ant rubbing antennae with your fellow ants on the run. Make an impression (smile sensibly – see below), then leave your business card and cling to the idea that most of the business you’re going to do will take place during weeks of follow-up emails after the show. Smiles do go a long way – especially among us Americans. 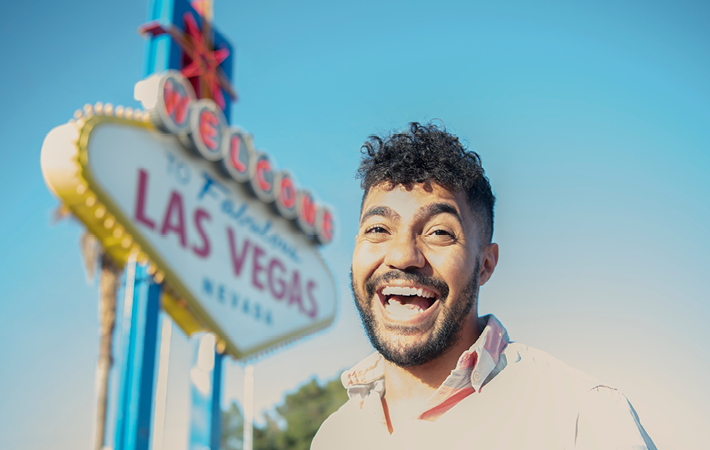 Non-Americans are suspicious of all the smiling that happens at NAB Show, but when Americans smile, they (we) really do mean it – or at least we would like to mean it. But you do have to pace yourself with smiling. If you’re not used to it, your cheeks will quiver with fatigue by the end of day one and you’ll have a splitting migraine by day two. One good way to conserve your energy is to do a lot of listening to the people you’re meeting with. It’s a good rule of thumb in life that you should always do more listening than talking anyway. But a deep frown, combined with intense nodding at every fourth or fifth word, will recharge cheeks for smiling later. I’m from Southern California. As a result, when I tried to eat the Mexican food in the NAB Show canteen last year, I burst into uncontrollable sobbing and had to be stretchered out. 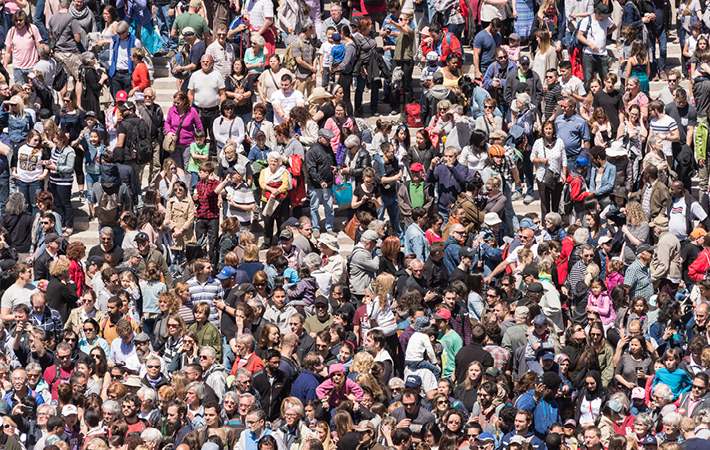 Last year, NAB Show had more than 93,000 attendees – that’s more than the amount of people who attend the Super Bowl, and by a good 20,000. The NAB cafeterias are about distributing calories to delegates and that’s all. If you go to one expecting really good Mexican food, having not had any in ages because you live in Britain now, you’re a big idiot, editor of FEED. Eat sensibly. High protein, low fat, lots of good fruit and nuts, etc, etc. Also, Cheetos are really plentiful at various stands on the show floor and they really hit the spot like nothing else when you’re utterly delirious by the middle of the third day. Remember that Las Vegas is in the middle of a desert. Deserts are dry. Also remember that you’re in a fully sealed, air-conditioned convention centre – which is a place only just slightly drier than a desert. And you’re walking. You’re walking miles and miles inside this waterless box set in the middle of a desert. If you wear contact lenses, this is especially horrible. One year at NAB Show, my eyes were so dry, every time I blinked, it made the sound of crinkling autumn leaves. So drink up, but don’t drink too much water. Otherwise you’ll be going to the toilets too often and you’ll start missing your appointments and begin to fall dangerously behind schedule. Every time you go to the toilet, you are flushing away valuable time that you could be using to drum up business. 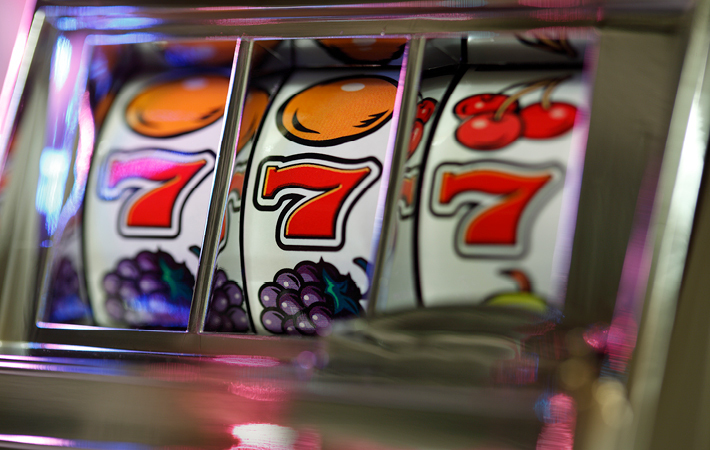 There’s a reason one of Las Vegas’s big hotels is called The Mirage. Las Vegas appears to be laid out in deceptively simple straight lines. Everything within line of sight. 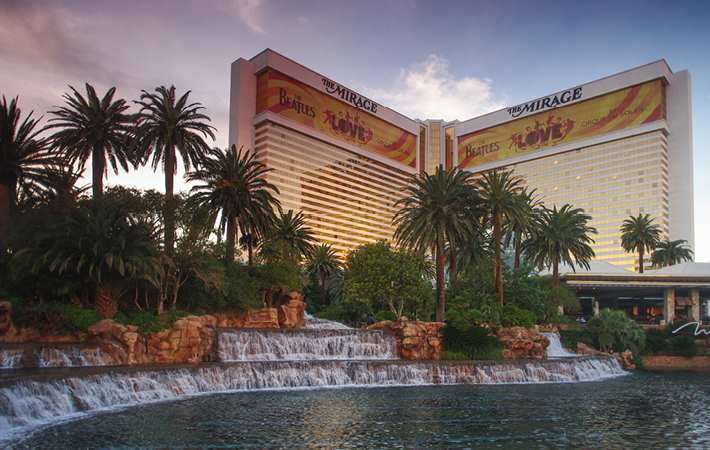 Make no mistake, this is… a mirage. It might have something to do with the town’s proximity to Area 51, but space is strangely distorted in Las Vegas. You may, especially if you’re a non-American, be tempted to walk to places in Las Vegas. This is a fatal error. You will set out on a simple walk up to your hotel – you can see it right there, ahead of you – and still find yourself walking six hours later having made no apparent progress. It’s easy to forget that some buildings in Las Vegas are over 5,000 metres tall and over 30,000 metres wide. Many of them create their own gravity wells and some of them aren’t even three dimensional. One NAB Show, we walked into a casino that was almost certainly a tesseract, which grew bigger the farther we ventured inside. Sure, that building looks like it’s just across the street, but make no mistake, if you embark on foot, you are likely to die on the journey. Take a cab. Please, for the love of God, take a cab. Seriously though, our main tip is that you make sure you have a good time at NAB Show. Enjoy yourself. Have FUN. The DPP, in its annual analysis of industry predictions (presented last month at Imagen’s Future of Video Summit, where yours truly was a co-presenter) listed partnerships as the key themes of 2019. We’re all in this industry together. When you do the rounds at NAB Show, you may think you’re looking for a deal, a purchase, a sale. But what you really need are partners – fellow travellers who you are going to make a future with for your mutual benefit. We hope you find your perfect partners and we hope that we at FEED can be one of them. 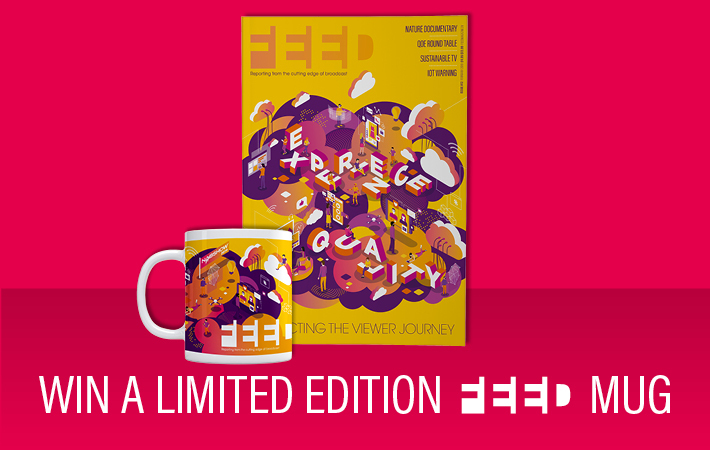 The Feed team will be doing the rounds, meeting with partners we’ve worked with over the past year, including AWS, Axinom, Brightcove, Lawo, NewTek, Sony, Dejero, Imagen and Telestream. And we’ll be back-to-back with meetings every day, hoping to find new ways to collaborate with new partners in 2019. Keep your eyes peeled for me, along with FEED features writer Chelsea Fearnley, as well as our charming sales team, Matt Snow and Chris Jacobs – and be sure to say hello. FEED is also a sponsor of NAB Show’s and AWS Elemental’s 4K 4Charity Fun Run and we’ll be running it (and walking it – we’re not proud) Tuesday 9 April bright and early at 7.30am (GMT -7) at Las Vegas’s Sunset Park. The run is one of the great broadcast trade show events and helps raise money for charity. Proceeds from this year’s NAB Show run will go to Girls Who Code, an organisation encouraging girls and young women to get a start in digital tech. See you next week! And remember… water! But not too much.